Originally, the gown was probably a sack, with loose box pleats at the back to allow for maximum display of the silk pattern. The gown would have been open down the front, with folded-back robings and rectangular cuffs at each elbow. 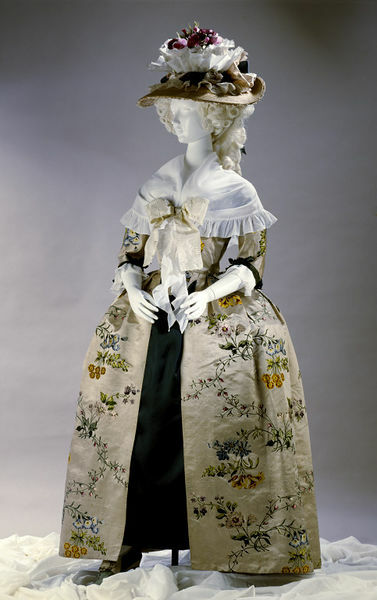 The last conversion in the 1780s to the style of that time was quite clumsily executed, suggesting that perhaps the gown had been handed down to a maid. The design is brocaded in coloured silks on oyster-coloured satin. Two large sprays of flowers fill the width of the repeat, linked by upward and downward trails of bright pink berries and rose buds. Among the identifiable flowers are roses, morning glory and auricula. From both sprays the flowers on upward stems are brocaded in shades of pink, fawn, lilac, white and black, while those hanging down are in shades of blue, yellow and red. A variety of greens colour the stems and leaves, and the flowers are shaded naturalistically by the weaving technique. The freelance textile designer Anna Maria Garthwaite (1690-1763) received at least 40 commissions for silk designs from a Spitalfields master weaver called Mr Gregory. The design for this silk was one of them. There were a number of members of the Weavers' Company with the name Gregory, so we do not know his exact identity, but the designs she produced for him are some of Garthwaite's prettiest and most fashionable, and include patterns for brocaded lustrings, damasks, tissues and satins. Gown of brocaded oyster coloured satin in coloured silks. Two large sprays flowers fill the width of the repeat, linked by upwards and downwards trails of bright pink berries and rose buds. From both sprays the flowers in upwards stems are brocaded in pink, fawn, lilac, white and black, while those hanging downwards are in shades of blue, yellow and red. Greens are used for the stems and leaves. The flowers are shaded in points rentrés. Close-fronted bodice and an open fronted skirt with a fitted back. 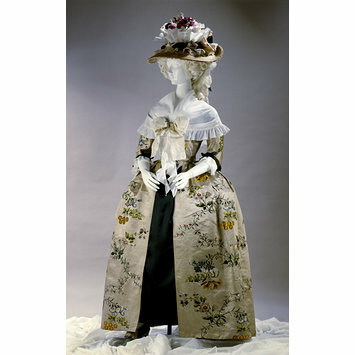 It was altered in the 1780s, and involved the back resetting of the skirt to give a concave waist seam, and removal of the cuffs and of the robings from the front of the bodice, which has been extended to meet in the centre front where it is now tied with three sets of ribbons. The ribbons are of red and green tobine with deckled edges. The sleeves are trimmed with lace. Ground with a satin of 5 interruption of 2. The wefts of the brocaded design are bound only by decoupures and not by a separate binding warp. The selvedge, 4 mm (0.125 inches), are two red stripes on self coloured ground. Gros de Tours. Width of silk (single comber repeat) between selvedges is 20.75 inches. museum number of design 5982.10. Gown of brocaded satin in coloured silks, designed by Anna Maria Garthwaite, woven in Spitalfields, 1740s and altered in 1780s.